Our 3 phase generator and electric generator sales are built on trust through our many years of high standard customer service and tough build quality for Australian conditions. Our water cooled diesel generators are especially recommended for our harsh climate. You can buy a petrol or diesel generator for sale and we deliver Australia wide or feel free to come and check out our showrooms. Electric generator for sale in Melbourne, Brisbane, and Perth. Single or three phase generator? Both single and three phase generators provide AC electricity but a 3 phase generator produces three separate waves of electricity at the same time. This ensures a continuous uninterrupted flow of power that never drops to zero. Single phase systems deliver one constant wave of power, but the power level varies. That means the electricity levels can and do drop to zero during the cycle. This happens to quickly to have an effect on your device. Residential power is single phase and there’s never a problem there. Single phase systems are less complex and cheaper. 3 phase systems are more costly to install and maintain, but depending on your power needs, they may be a necessity. They are needed for high-capacity situations like industrial and commercial areas. Data centers need 3 phase backup generators due to the increased distribution capacity. 3-phase systems can power multiple racks whereas single-phase systems can’t. Able Sales has the best prices in Australia and give you guaranteed backup and support. Why do we need 3 phase power supply? There are several reasons 3-phase is desirable over 1-phase power. One advantage of 3-ph over 1-ph has to do with instantaneous power (i.e. power generated or consumed at any instant in time within the power cycle). Consider a heating element in a 1-phase circuit. Voltage and current are in phase. Both cross zero volts twice during a cycle as they go positive and then negative. Put simply, a 3 phase generator is like having three single phase generators in 1, however, let’s say you have 1 line running a light and 1 powering a heavy pump or motor and 1 line doing nothing you will get voltage fluctuation and the genset will shut down so you must use all 3 lines out as evenly as you can. Three-phase systems can produce a rotating magnetic field with a specified direction and constant magnitude, which simplifies the design of electric motors. In 3-phase power distribution, it requires a lesser amount of copper or aluminum for transferring the same amount of power as compared to single phase power. The size of a three-phase motor is smaller than that of a single-phase motor of the same rating. 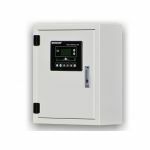 A single-phase supply system, the voltage and current reaches its maximum value after every 0.02 seconds, but in case of the three-phase supply system, each phase reaches its peak value after every 0.006 seconds. That is one major advantage. Put simply, single phase has 1 active pin 1 neutral pin and an earth pin = 240 volt. 3 phase has 3 active pins 1 neutral pin and 1 earth pin if you join all active pins together to make 1 active pin you will have a 720 volt output. We've just written a new blog post looking at electric generator, air cooled diesel generators, 3 Phase generators and water-cooled generators vs petrol! Able Sales provides Australia's largest online collection of Diesel Generators, power generators, 3 phase generator and 3 phase diesel generator for sale.